Writer-director Richard Maxwell has created a distinctive body of work in the last fifteen years. Emerging from Manhattan’s downtown theater scene (he started out as an intern for the Wooster Group assisting Elizabeth LeCompte when she was directing the company’s 1994 production of Eugene O’Neill’s “The Emperor Jones”), he’s become one of those artists embraced by European festivals yet virtually unknown to mainstream American theatergoers. He has forged a very particular style based on subtracting from theater anything that looks artificial or fake or stagey or actor-ish. His performers, whether they are very experienced or just the opposite, adopt a flat, deadpan, neutral, non-expressive style of delivery that’s as close as possible to “just saying the words” – not like robots, but like the most affectless characters in the hippest melancholic graphic novels (by Daniel Clowes, for instance). As a playwright, Maxwell occupies a place in the non-narrative playwriting lineage that includes John Jesurun and Richard Foreman, probably going back to Gertrude Stein. The plays aren’t heavily wrought. He seems to pretty much accept whatever pops into his head. Non sequiturs abound. Character development is non-existent. It’s an experiment to see what can come from stripping away everything but actors and dialogue. The staging is very minimal a la Jesurun (without the video backdrops) and the writing is quasi-philosophical a la Foreman (without the visual circus). Music figures in almost every Maxwell show (I remember characters in “Flight Courier Service” singing while playing tracks on a cheap Walkman, and stand-and-deliver songs in “Showy Lady Slipper”). The songs are really, really basic; they sound like songs you might make up on the spot during rehearsal. It’s not difficult to understand the appeal of Maxwell’s work in Europe. Its strong basis in theory ties it to other forms of conceptual performance. It’s clearly related to Brecht in the way it exposes the mechanisms of theater (without the social commentary) and the way it achieves the so-called “alienation effect” by make super-ordinary words and actions come across as exceedingly strange. It’s also related to the Dogma 95 movement in film, whose purist manifesto foreswore the use of special effects and fancy technology, or, to go back farther into history, the minimalist approach favored by modern dancers and painters, best articulated by Yvonne Rainer in her famous 1965 manifesto saying "NO to spectacle no to virtuosity no to transformations and magic and make believe no to the glamour and transcendency of the star image no to the heroic no to the anti heroic no to trash imagery no to involvement of performer or spectator no to style no to camp no to seduction of spectator by the wiles of the performer no to eccentricity no to moving or being moved." 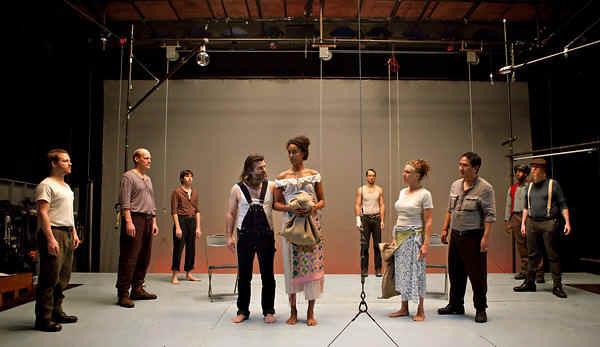 With his own company, the New York City Players, Maxwell has cultivated a posse of actors to perform his own plays, and there the meeting of acting and writing styles has occasionally achieved a sublime coherence. (Gary Wilmes, currently on Broadway in “Chinglish,” is a Maxwell veteran.) But when Maxwell’s house style is applied to other playwrights’ work, it runs two perilous risks: making the actors look bad and amateurish, and coming off as some kind of uneasy parody of the text. I’ll never forget seeing Maxwell’s production of Shakespeare’s “Henry IV Part I” at the BAM Next Wave Festival in 2003, whose cast included some people who’d never acted in a play before. It really did look and sound like a pretty lame high school production. At first it seemed kind of funny, like a “Saturday Night Live” sketch. But the joke wore off, and tedium set in, very quickly. Twenty minutes into the intermissionless show, the walkouts began, and they continued steadily until about half the audience was gone. It was a fascinating phenomenon in many ways. The BAM audience is notoriously tolerant of experimental performance, but I hadn’t seen this much active hostility from the audience since the legendary Kathy Acker/David Salle/Richard Foreman collaboration “The Birth of a Poet.” The stage lighting was bright so the performers had to watch this stream of people voting on the production with their feet. I felt sorry for the actors. At St. Ann’s Warehouse, where Maxwell’s production of Eugene O’Neill’s “Early Plays” is being performed as a collaboration between the NYC Players and the Wooster Group, the audience was absolutely respectful at the performance I attended. But I still felt sorry for the actors, many of whom looked stiff and stilted while blankly reciting the O’Neill texts. “Early Plays” incorporates three of the four brief one-act plays written between 1914 and 1918 and first produced in 1924 as “S.S. Glencairn,” the name of the ship whose crew populates the plays. For contemporary readers, two elements stand out from these early plays based on O’Neill experience aboard merchant marine steamships: their hokey representations of dialect spoken by uneducated whites and Caribbean darkies, and their unfiltered rendering of the sailors’ casual racism. Maxwell’s stripped-down staging maximizes our attention to these cringe-making elements without giving us much to admire. Apparently, it was LeCompte who suggested that Maxwell direct the plays, after trying and failing to find some satisfactory way to mount them herself with the Wooster Group, which has its own history with both Eugene O’Neill (having produced “The Hairy Ape,” “The Emperor Jones,” and scenes from “Long Day’s Journey Into Night”). But LeCompte’s interest in looking at O’Neill through the windows of gender, race, and technology are not the same as Maxwell’s. A lot of Maxwell’s plays focus on groups of young working-class men, and my guess would be that it was on that basis that he felt some kinship to the early O’Neill plays, each of which involves a group of sailors in a simple straightforward plot. In “Moon of the Caribbees,” they encounter booze and women after a long stretch at sea; an injured sailor dies onboard in “Bound East for Cardiff”; and a young homesick sailor tries and fails to escape the indentured servitude of shipboard life in “The Long Voyage Home.” Maxwell intersperses these plays with three very rudimentary songs of his own, played on piano and guitar and sung in coarse unison by all the actors. There’s something proudly proletarian about Maxwell’s productions, as if they’re staunchly committed to the idea that anyone can sing and act. Nothing about this production was beautiful, nor was it meant to be. I was bothered by the production’s demands that the actors purposely hide their talents; Valk, extraordinarily powerful in Wooster Group productions, is a bland cipher here, for instance, and Jim Fletcher once again gets used as a sort of generic sight gag – the big tall dolt – in contrast to the nuanced performance he gave under John Collins’ direction in Elevator Repair Service’s “Gatz.” My companion characterized the performances as haunted, generously perceiving them as intentionally hollowed out, thereby inviting the audience to conjure another, more fleshed out set of performances. We both agreed about the one scene where something broke through the flatness of the production’s style – a brief “Brokeback Mountain”-like deathbed scene between Ari Fliakos’s Driscoll (below right) and Brian Mendes’s Yank (below left).